Vancouver, with several new and old architectural gems, used to have a handful of stunning buildings that have since been demolished, much to the chagrin of citizens at the time. The Second Hotel Vancouver, the Georgia Medical-Dental Building, and the old Birks Building come to mind. The latter, which was located at Granville and Georgia until it was demolished to make way for the Scotia Tower in the 1970s, is the focus of today’s photo roundup. June, 1946. Birks Building on Georgia and Granville. Photographer: Don Coltman. Archives# CVA 586-4399. September 1912 to March 1913. Vancouver Archives# M-14-30 to M-14-51. “Inside, sparkling jewelry, silver and fine china attracted the most demanding, and wealthy, clientele,” notes Canadian Encyclopedia. 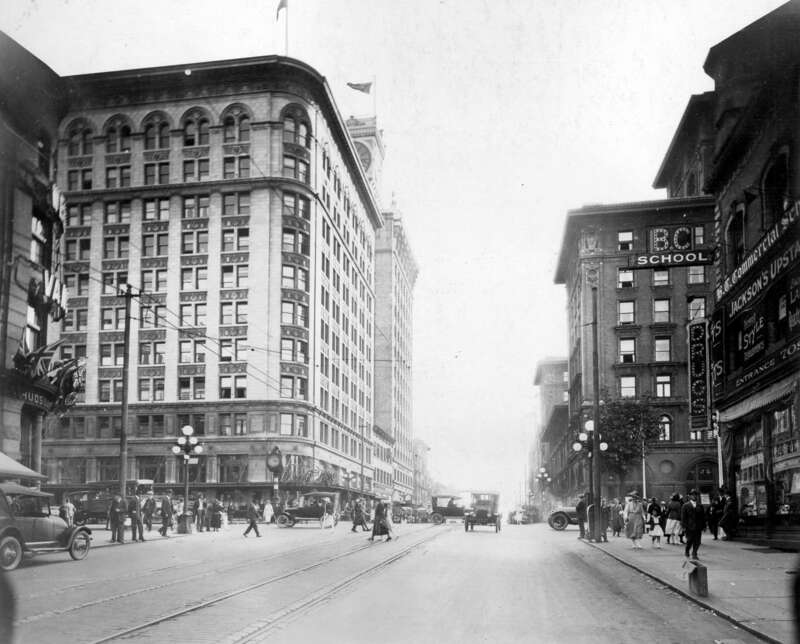 1922: Looking south on Granville, Birks Building on the left. Archives# CVA 371-825. 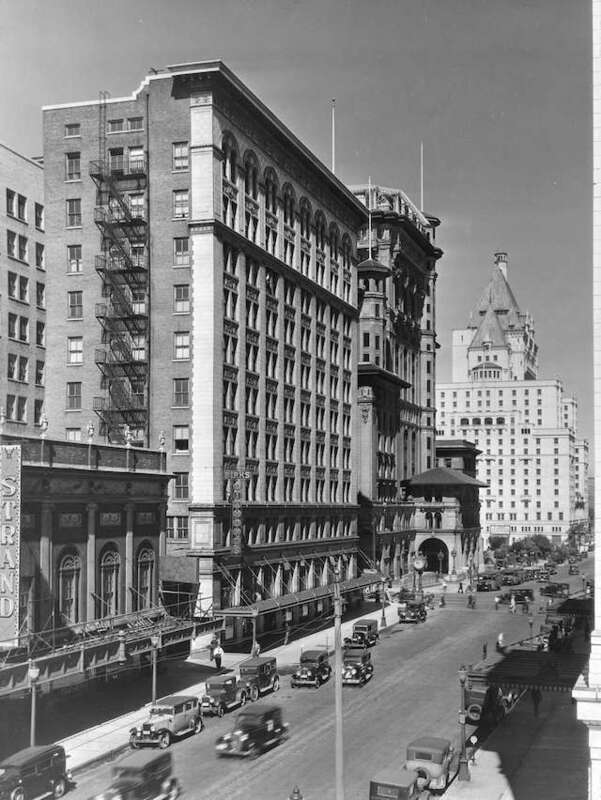 1939: Birks Building on the left, followed by the Second Hotel Vancouver and the Third (current) Hotel Vancouver. Leonard Frank Photo. Archives# CVA 586-4615. 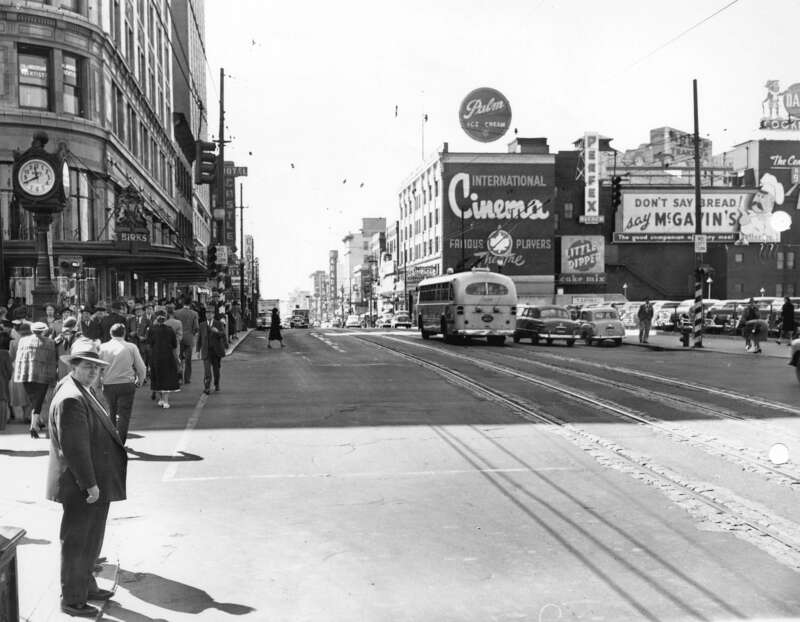 1951: Granville and Georgia. Archives# CVA 772-7. 1961: Hudson’s Bay Building, Birks Building, Vancouver Block Building. Archives# 2011-068.01. 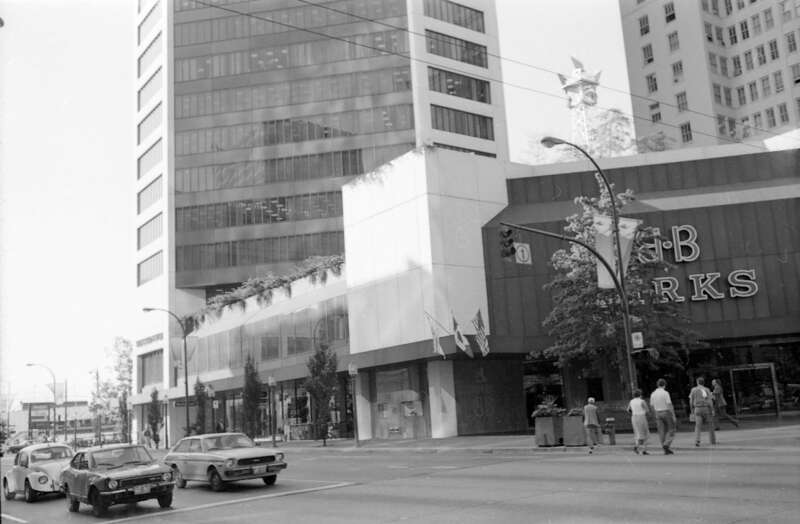 The Birks building was torn down in 1974 but not without furious opposition from the general public, which was shocked that one of Vancouver’s signature buildings was being demolished. According to local historian and author Michael Kluckner, on March 24th, 1974 at 2:00pm there was a mock funeral for the building that marched down Georgia Street. 1981: Birks Building at Granville and Georgia. Archives# CVA 779-E02.17. 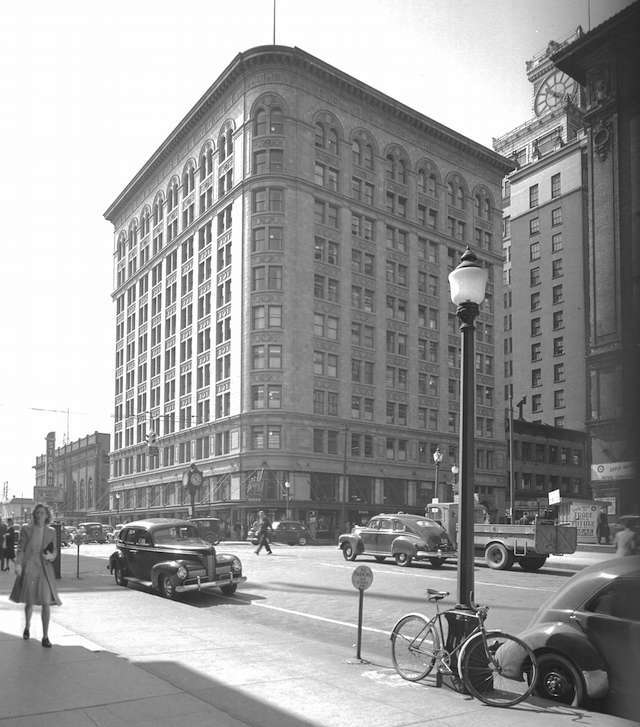 Today, you can find Birks at 698 West Hastings Street, in the old Canadian Imperial Bank of Commerce Building. The Birks Clock is parked outside on the corner, just a few blocks down from its original location on Granville Street. So when they moved out and changed to London Drug? I know it was Birks before but nobody believe me. In late 80’s or early 90’s? 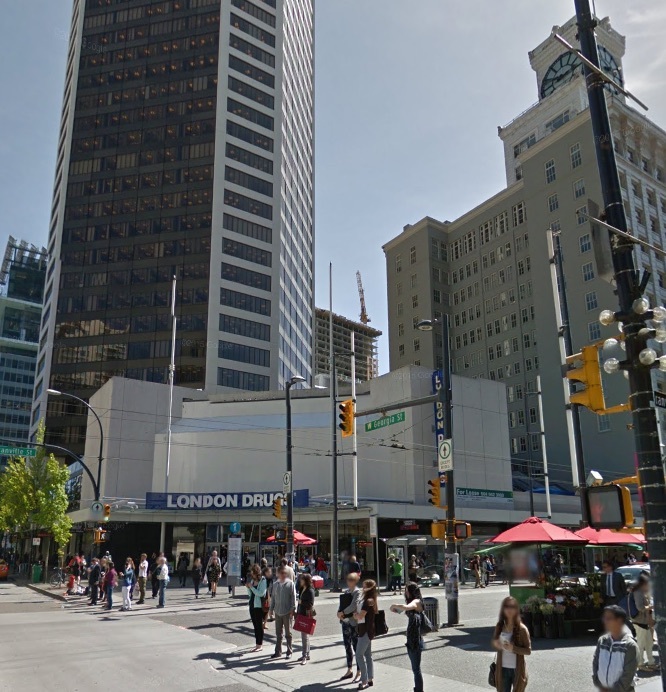 The Birks building was torn down in 1974, when the Scotia Tower was built (which is home to London Drugs now). 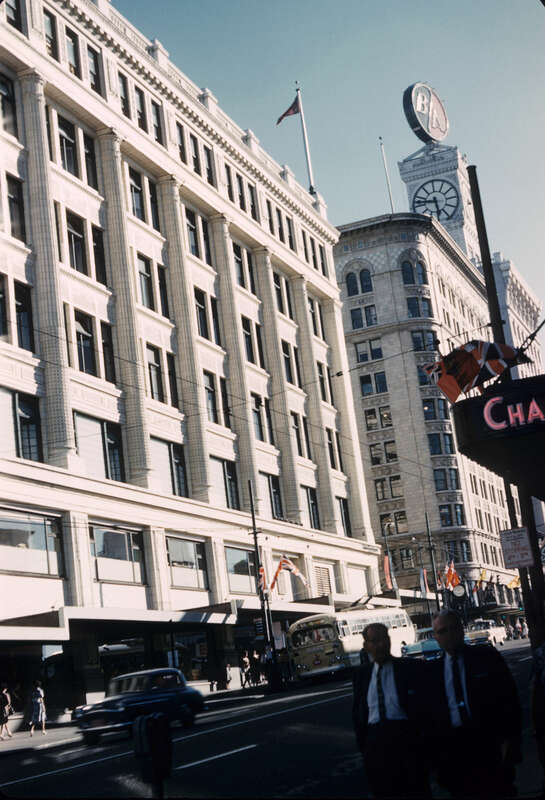 when they moved to 698 West Hastings St. [from Birks’ website: “moved into their Granville at Hastings Street location in 1994”] As you can see in the photo from 1981 above, the front of the building says “Birks”. Yes Yasuko, it was still a Birks until 1994 in the new building then they moved. Thanks for the info, Pauline!